Here’s another video about Urban sketching ! This one was made in the beautiful Kenrokuen Garden in Kanazawa. It’s one of my favorite spots in Japan. Kanazawa is a very beautiful city, and the Kenrokuen Garden is one of the most beautiful gardens in Japan. I painted in a watercolor sketchbook called “hand.book” manufactured by Global Art Materials. It has a nice square shape. The paper is good quality. I used travel brushes: a diagonal sable brush by Rosemary’s & Co and a synthetic Perla Escoda brush, with my usual two Pocket Palettes, the blue-green one and the orange-browns one. 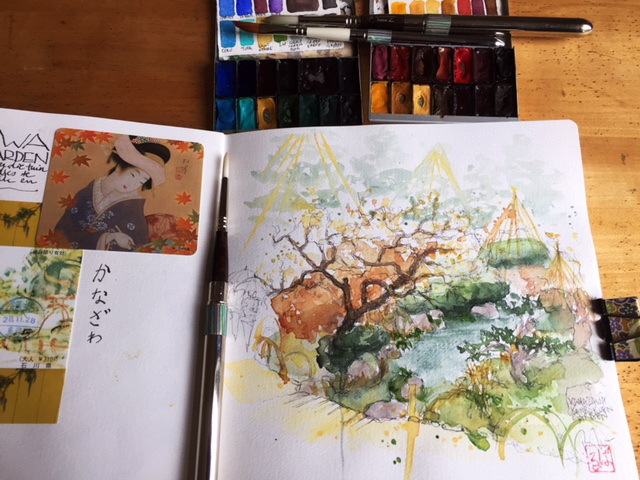 More details here : http://barbaraluel.com/product/pocket-palette-blues-greens/ and http://barbaraluel.com/product/watercolor-pocket-palette-yellows-reds-browns/ . I do all my urban sketching with these pocket palettes to have lighter luggage. It seems very small but there’s more then enough paint for long trips. Even after 3 weeks of sketching every day I didn’t even use half of the paint. The video starts with the painting. I didn’t show the drawing part so it wouldn’t be too long. The drawing was made with a fine ball point pen. For the water I used Green earth and Perylene green. For the shadows and tree trunks I used sepia and a grey made of orange and ultramarine blue. The trees far away are painted without drawing to make them look far away, and painted in light Green Earth.